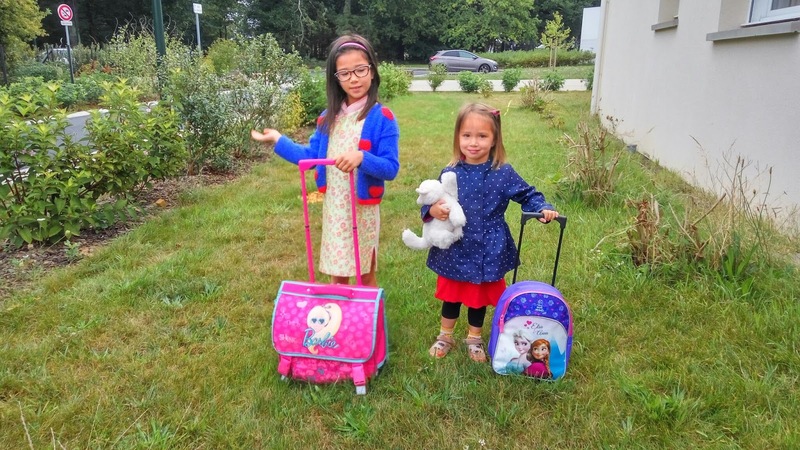 The school year starts in general in Sept in France. I always wonder why they would "start" something in Sept, the 9th month of the year, instead of in January. When I told my coworkers about this, they can't imagine that in Malaysia we start the school year in January, and, without a long summer holiday break! 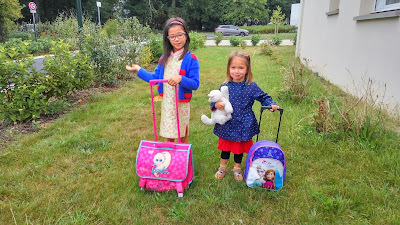 Anyway, the girls were eager to go back to school. Every morning except Wednesday during the week, I have to prepare them for school. I usually wake up earlier to prepare myself, then wake them up to have breakfast together. It was a stressful moment, as either they complained about the breakfast, or they fought, or they took their time for everything. Especially the youngest, she would first lay down in sofa, refused to eat anything. Then by the time everyone was done, she came and requested breakfast. Of course I refused, I didn't care if she went to school with empty stomach, I had already warned her enough about the consequence. At one point, the eldest required a different hair style per day, and she had it listed on a paper. Some of them took me 10 minutes, and sometime she changed her mind last minute. The school gates open at different time as one is in primary and one is in kindergarten. I have to send the little one to her class, sometimes she wanted me to stay to see her play a game, to show me something she has learnt. When I finally managed to walk out of school, there was traffic jams waiting, and I showed up always a bit late at work. 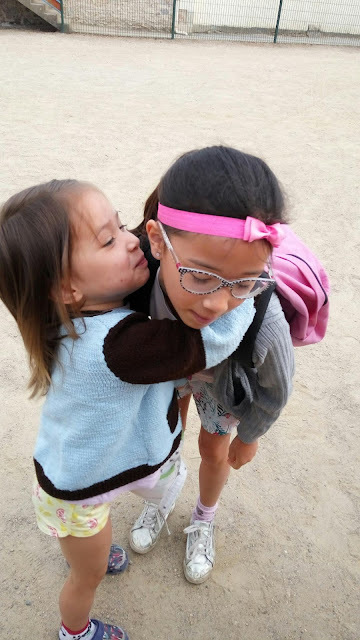 A morning kiss to her sister before entering their school compound (primary school and kindergarten are separated by a gate). Schools here will have 6 or 7 weeks of classes, then follows by a 2 week break. A lot of parents appreciate the break, including me. The girls usually go to their grandparents, that leaves me some personal time, and very relax mornings. 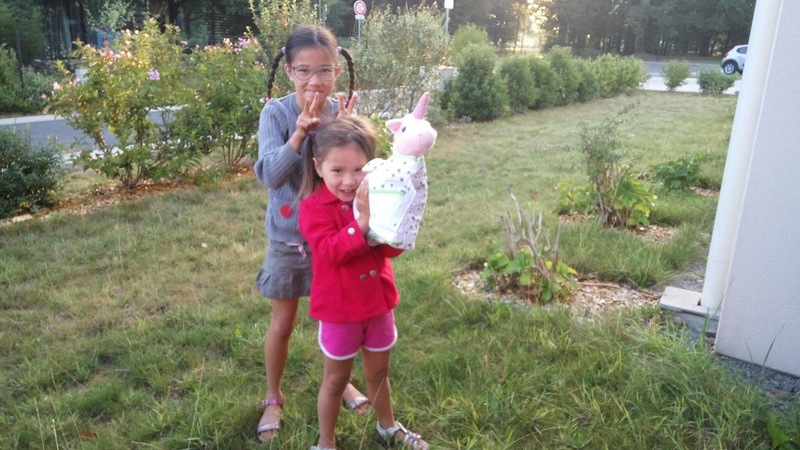 It is amazing how having kids and without kids can change one's day. After the break de la Toussaint, we suddenly manage to have less stressful mornings. Hubby wakes them up before going to work, and the youngest stopped laying down on sofa, instead she comes directly having breakfast with us. And most importantly, the eldest prepares breakfast for me, and she is very proud about it. I still have to rush the little one to eat faster, as she can spend all her time talking or day dreaming. The eldest is less picky about her hairstyle as well. Sometimes they are done earlier so they read on sofa or play together while waiting for me to get ready. I always try to clean up the kitchen after breakfast. The little one was chosen as class representative. That was a surprise to me, but well three of them were chosen because there was a tied at vote for two of them. 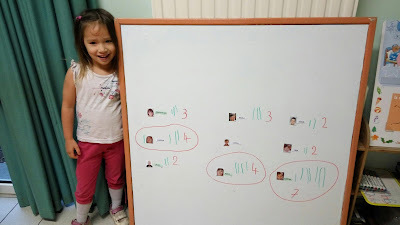 The election process was quit formal, they had to write the name of the person they chose on a paper and put it inside an envelope, and the teacher counted the vote by taking out the paper one by one. A democratic process at young age. I always remind myself, that there is only less then 2 school years left that they will go to the same school together. At one point, the eldest will go to middle school, and they will each have their own circle of friends, and school life. Therefore, I should appreciate these mornings, when they are still eating and playing together.